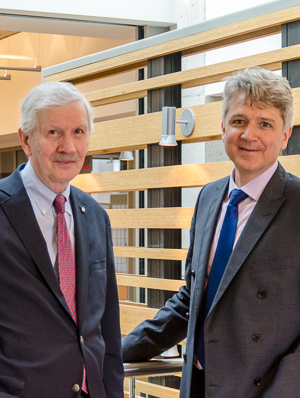 The Faculty of Law is pleased to congratulate Professor Emeritus Armand de Mestral (left on photo) and Professor Fabien Gélinas on having been appointed to the new North American Free Trade Agreement (NAFTA) Roster for Canada, announced by the Government of Canada on 21 February. They were named to the Chapter 19 (Trade Remedies) Roster for a ten-year Governor-in-Council appointment. They are joining another prominent dispute resolution specialist at the Faculty, Professor Andrea Bjorklund, who is on the Chapter 19 Roster for the United States. Sophie Nappert, BCL’86, LLB’86, founder of the Nappert Prize in International Arbitration, was also appointed to Canada’s NAFTA roster. Chapter 19 of NAFTA, the trilateral free-trade agreement between Canada, the US and Mexico, deals with complaints by state parties concerning anti-dumping and countervailing duties imposed on goods crossing borders. Measures of this kind recently made the headlines in relation to duties levied by the US against Canadian aircraft manufacturer Bombardier. When disputes arise between NAFTA parties, panels composed of arbitrators selected from the Roster are tasked with deciding on the legality of such measures. The Chapter 19 dispute resolution system has been a central topic in the ongoing negotiations over the future of NAFTA. Professor Emeritus de Mestral, C.M., has taught constitutional law, law of the sea, public international law, international trade law, international arbitration, the law of the European Community, and public international air law. His current research interest is the law of international economic integration. He has drafted books, articles and reports in English and French on international trade law, Canadian comparative and constitutional law, and international law. He has served on WTO and NAFTA dispute settlement and arbitration tribunals. He was made Member of the Order of Canada in December 2007. In December 2014, he was appointed a Senior Fellow at the Centre for International Governance Innovation (CIGI). Professor Fabien Gélinas, Ad. E., teaches and conducts research in the areas of international dispute resolution, common law and civil law contracts, commercial law and legal theory. Formerly General Counsel of the International Court of Arbitration of the International Chamber of Commerce, he is the immediate president of the Arbitration Committee of the Canadian Chamber of Commerce and ICC Canada. Professor Gélinas is cofounder of Montreal’s Cyberjustice Laboratory, and head of the Private Justice and the Rule of Law Research group. Professor Gélinas was awarded the Barreau du Québec’s Advocatus Emeritus (Ad. E.) distinction in 2017.